The contest challenges students to create a great-tasting school lunch that meets nutrition standards on a tight budget, using only ingredients commonly available for school food service. 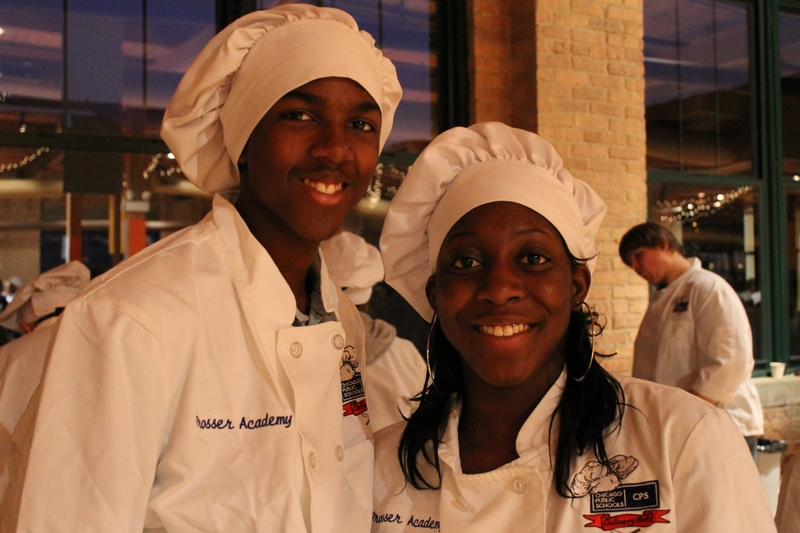 Students must create recipes that include no more than six steps so that they can easily be replicated on a large scale in real school kitchens. 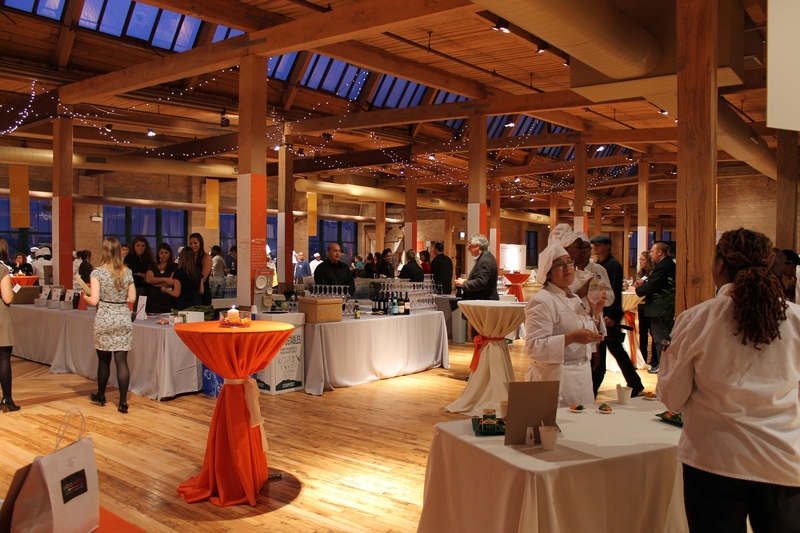 The event was held at the stunning Bridgeport Art Center here in Chicago. I walked in and immediately started snapping shots. The venue was perfect and I could feel excitement in the air. I was there before the crowds showed up so I was able to walk around and chat with every team. 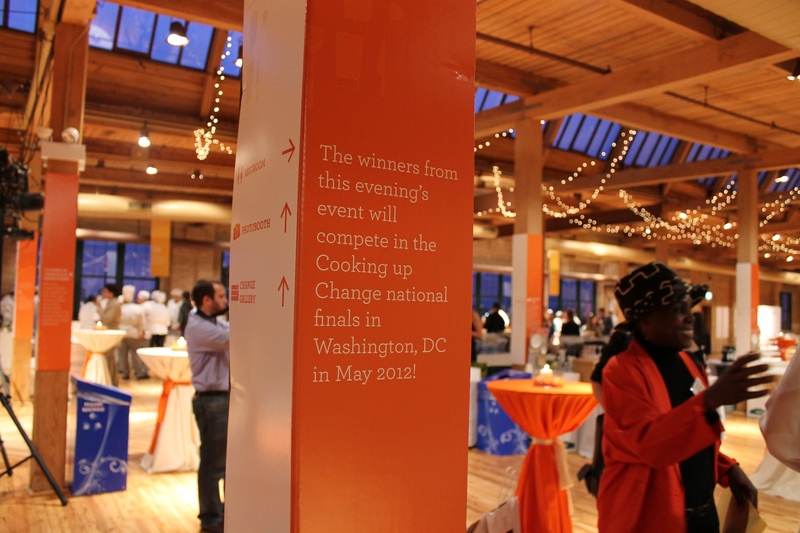 There were 12 teams from across Chicago. 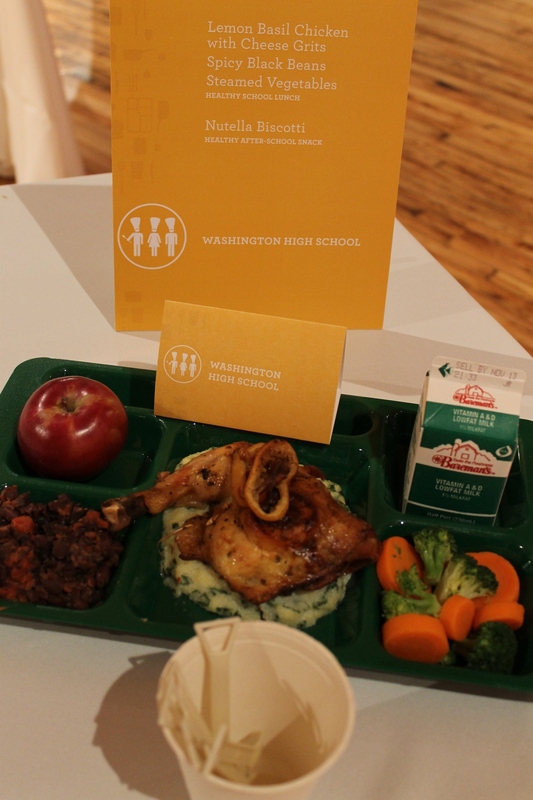 Pictured above: “Lemon Basil Chicken with Cheese Grits, Spicy Black Beans, Steamed Vegetables.” This menu (above) from Washington High School also featured a “healthy snack” (here it’s Nutella Biscotti), which was another component of the challenge. Each team had to create a snack, which was voted on by the crowd in attendance that night. I was focused on the school lunch meals so I didn’t get many shots of the healthy snack offerings. 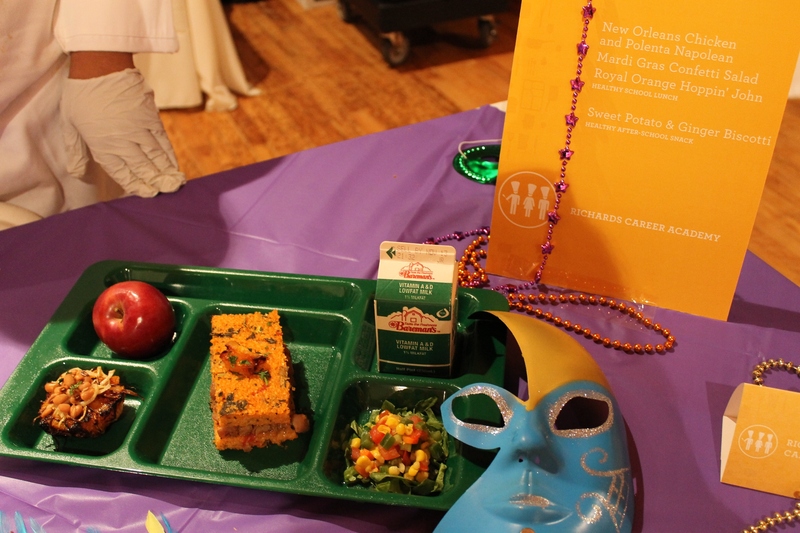 Pictured above: “New Orleans Chicken and Polenta Napolean, Mardi Gras Confetti Salad, Royal Orange Hoppin’ John.” Polenta in a school lunch? I was impressed. I stopped to chat with these students from Prosser Career Academy (above). 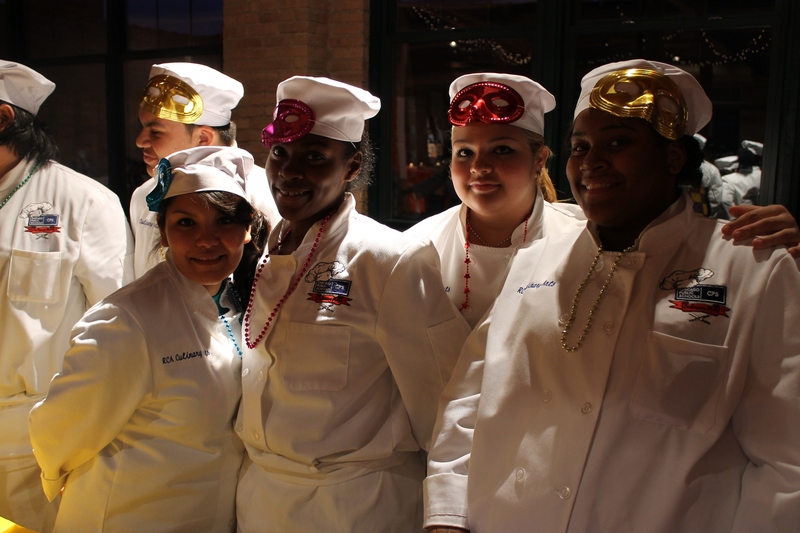 Don’t you love that the students wear chef uniforms? I have visited Prosser a couple times on citywide professional development days because the school has an auditorium large enough to accommodate big groups. I asked the students if their principal is the one who plays guitar for the students and they said that he’s their guy! The principal, whose name escapes me at the moment, got up in front of a room of at least 150 CPS speech pathologists and played a song on his guitar for us. He’s a talented musician and I’ve been told he’s also an excellent principal. So I wanted Prosser to win — I couldn’t help being biased. Luckily I was not a judge. Pictured above: “Chicken Walk-About, Sangria Fruit Salad, Sweet Potato Chips.” I tried the fruit salad and it was great! Everything looked great on the plate. 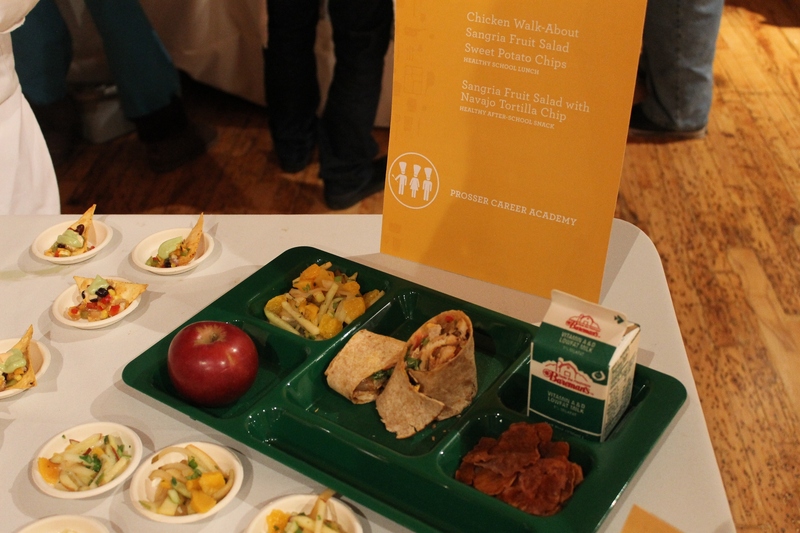 What a neat event–It’s great to see young students creating healthy meals for their schools!